Tycho's Remnant - Universe Galaxies And Stars Section. Chandra View of Tycho's Remnant. In 1572, Danish Astronomer Tycho Brahe observed and studied an exploding star that would later be named after him. NASA's Chandra X-Ray Observatory shows that the Tycho's supernova remnant is an expanding bubble of debris which is inside a larger bubble of high-energy electrons. Astronomers think that remnants like this could be a source of cosmic rays; high-energy nuclei found throughout the Galaxy which constantly bombard the Earth. 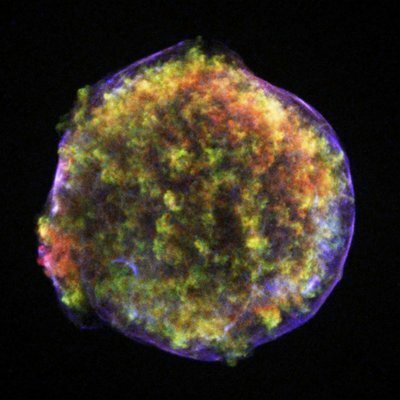 Tycho's supernova as viewed by the Chandra. Image credit: NASA.